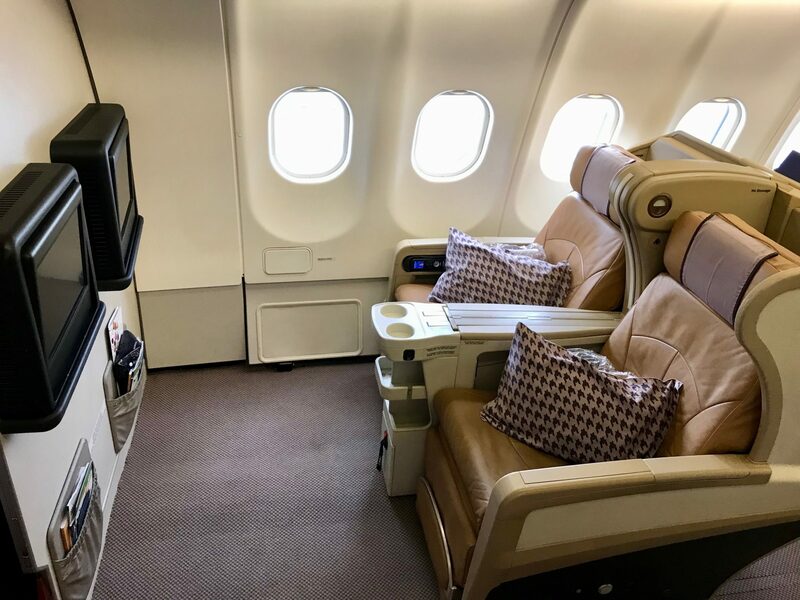 *Our trek from Ho Chi Minh City to Melbourne included 1 flight on Singapore Airlines’ A330 business class from SGN>SIN, then the second flight on Singapore Airlines’ Boeing 777 business class from SIN>MEL. 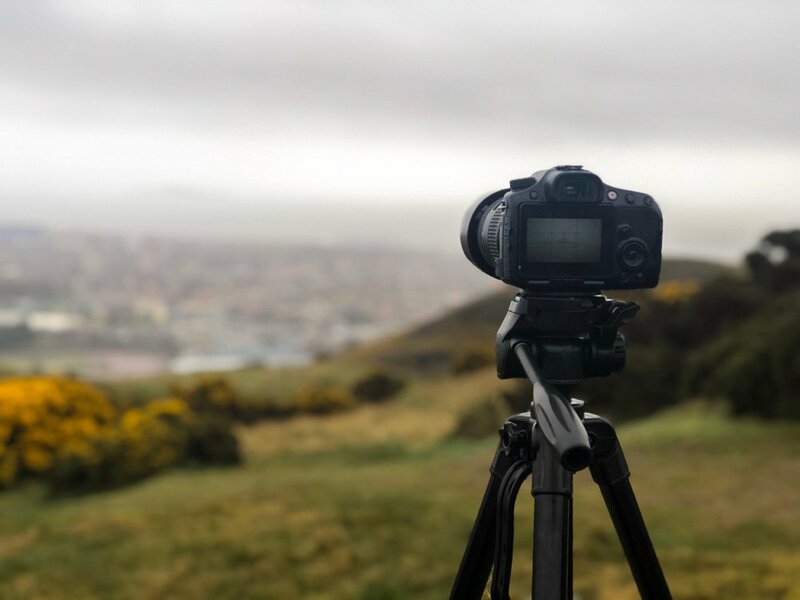 This review is strictly concerning the A330 product, but you can head on over and check out our review of the Boeing 777 product too. This was an easy reservation to make, and the ticket covered the entire route from Ho Chi Minh City to Singapore and then to Melbourne, our final destination (SGN>SIN>MEL). 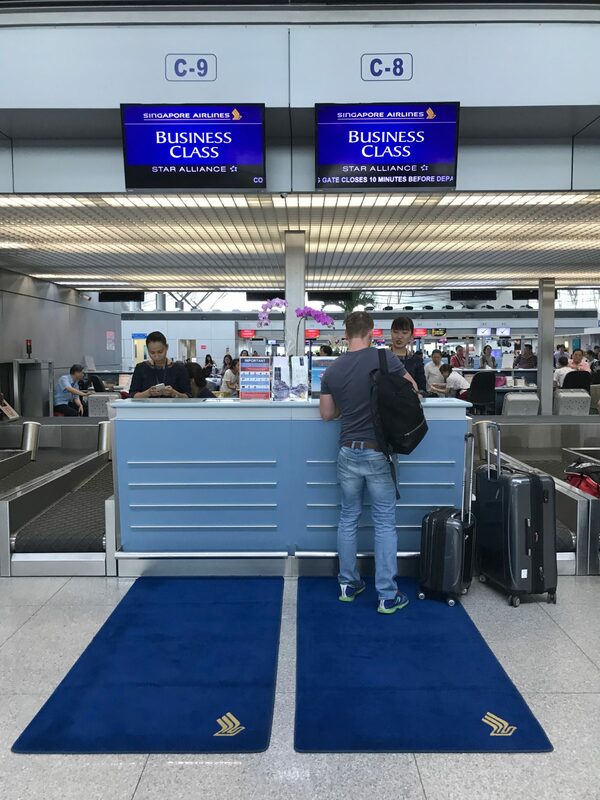 To book business class tickets for both of us, Alex transferred 93,500 points from his Chase Ultimate Rewards account directly into his Singapore KrisFlyer account. The main card that Alex used to earn these points was the Chase Sapphire Preferred® Card. Of course, he didn’t transfer the points until he had first found award space on Singaporeair.com about 6 months in advance. 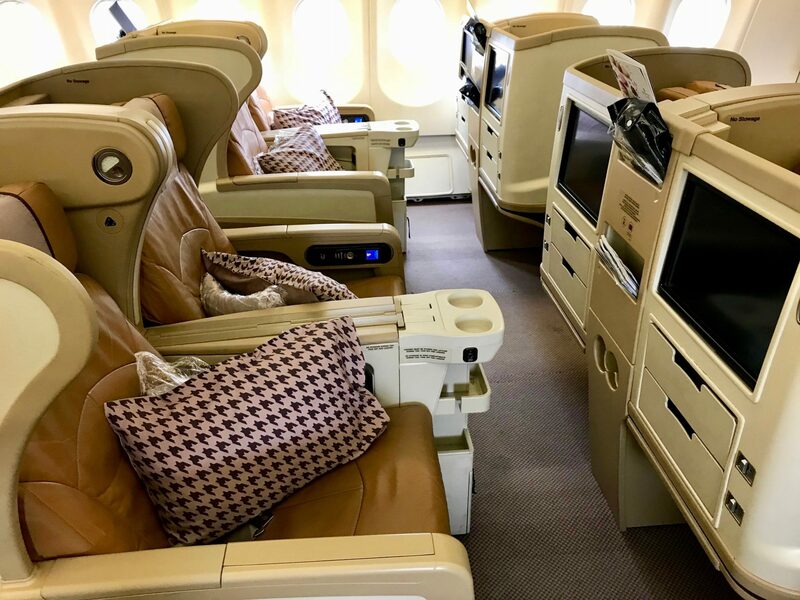 However, because this was a business class flight (and not first class), it’s definitely a lot easier to find space — that means you could still have a good chance of finding award space closer to your departure date. Just as with our flight from JFK>FRA>SIN in Singapore Suites, you don’t need to call anyone to make this booking as it can all be done on Singapore Airline’s website. On top of the 93,500 KrisFlyer miles to cover us both, we paid the obligatory $212 USD per person in taxes. Though it wasn’t the cheapest, if we had paid for this in cash it would have been ~$2,850 USD for both of us to fly business on this route. Remember: Chase points are very easy to earn, but you could also transfer your American Express, SPG, or Citi points since Singapore Airlines is a transfer partner with all of them. 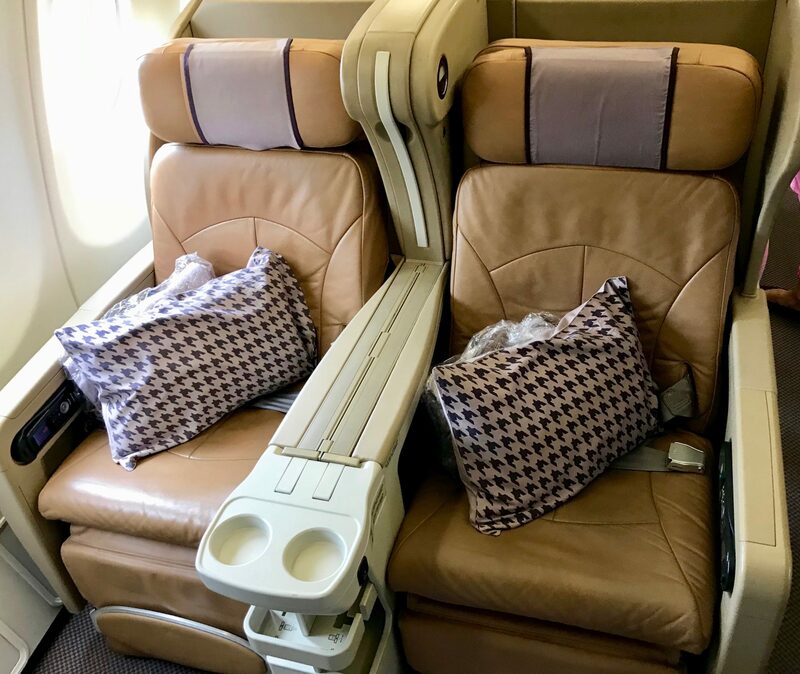 Getting to experience Singapore Airlines’ business product about a week after Singapore Suites was very exciting for us! Check-in at Tân Sơn Nhất was very smooth. We were served at the Singapore Airlines counter with extremely friendly attendants and smiles all around. We were a little nervous when we realized the SASCO Rose Business Lounge was open to passengers on 22 different airlines. As it turns out, though, we had nothing to worry about! The lounge was spacious, not too crowded, and had a nice selection of breakfast-type food and beverages. It was a great place to relax and get some work done pre-flight! The Singapore Airlines cabin crew turned on their ridiculously warm welcome yet again. They were sure to greet each of us by name and show us to our seats. Even though the cabin was busy, they took the time to deliver our menus and a welcome drink. We opted for the bubbly — they were serving a delightful Charles Heidsieck Brut Réserve. As we mentioned previously, this first leg from SGN was on Singapore’s A330 product. 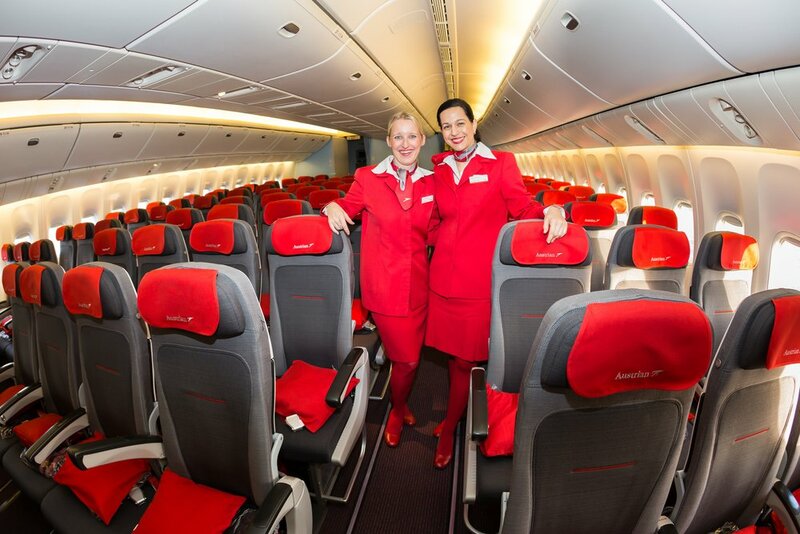 While this product is their “old business” class, it was impressive nonetheless! The cabin was clean and tidy and the seats were well kept and roomy, coming in at a 24.5″ width and a 60″ pitch. Singapore states these seats were “designed like a shell” for comfort and privacy, with a partition that can be deployed for even more privacy. It is important to note that with this particular cabin arrangement, not every seat has direct aisle access. Additionally, these seats almost lie completely flat, achieving a 172-degree recline. For a (comparatively) short flight, this was perfectly comfortable. We were also pleasantly surprised that the TVs were a decent size (for an “older” product especially)! 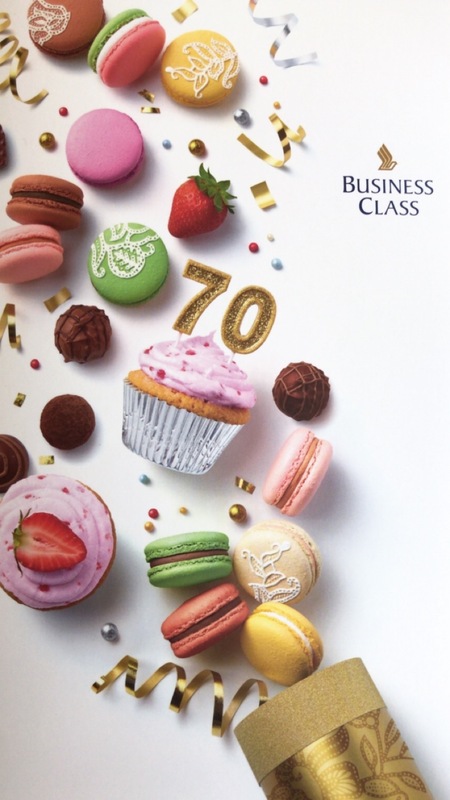 In terms of dining, Singapore Airlines was currently celebrating 70 years of business class with a special menu. We enjoyed another glass of bubbly with a salad appetizer, then got into our main dishes. While this service doesn’t utilize the trendiest flatware or china, the food was flavorful and not at all mushy or soggy like airplane food sometimes can be. That’s really all that matters! Gate-to-gate entertainment always makes a flight more exciting since you don’t have to wait until you’re up in the air to start your movie, show, or game. 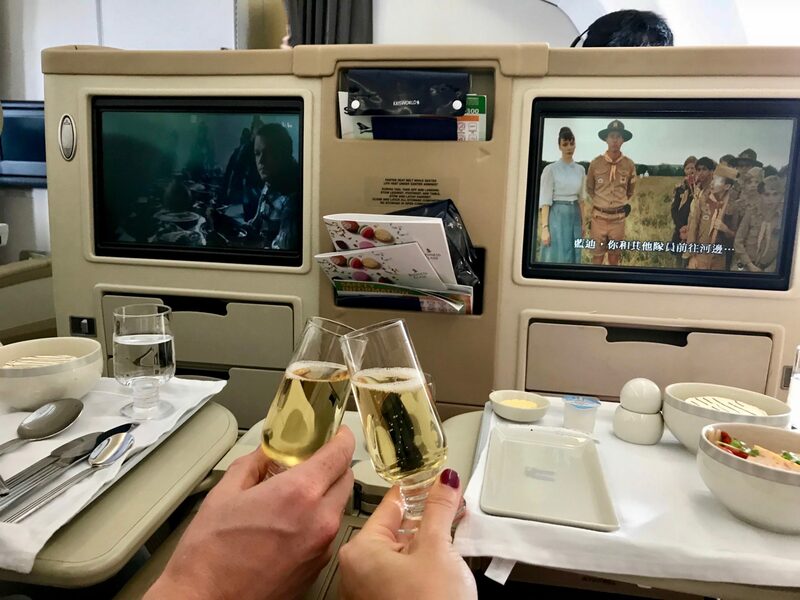 We were excited to see Singapore Airlines offering an array of seasonal movies — since we flew in October (and near Halloween), there were a number of scary selections to choose from in addition to new titles and old favorites. Again, the service on this Singapore Airlines A330 flight did not disappoint. The cabin crew were quick to attend to us without being intrusive and were quite friendly, making us feel very welcome. We chatted about why we had visited Vietnam, where we were headed, and of course confirmed we’d be back to fly Singapore Airlines again as soon as we had the chance! 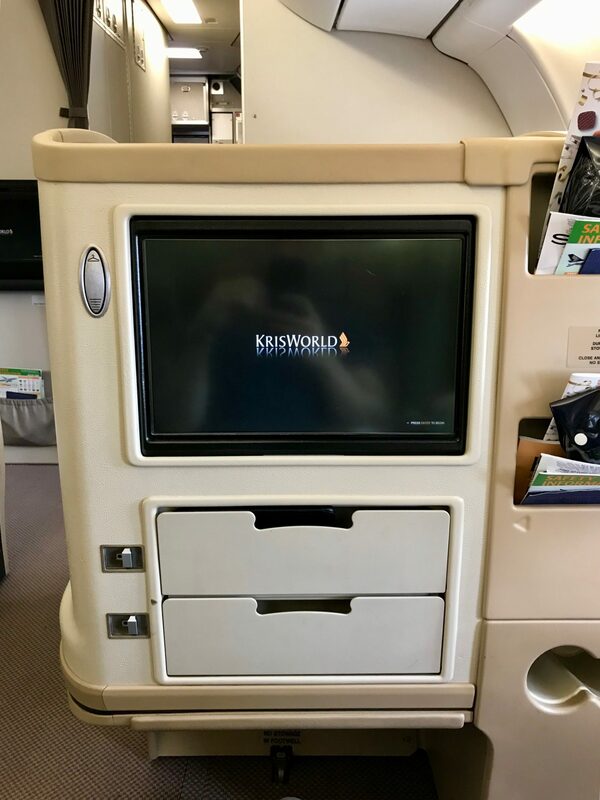 While this certainly isn’t the newest business class product Singapore Airlines offers, we were still completely happy with the experience and would certainly fly this product again! 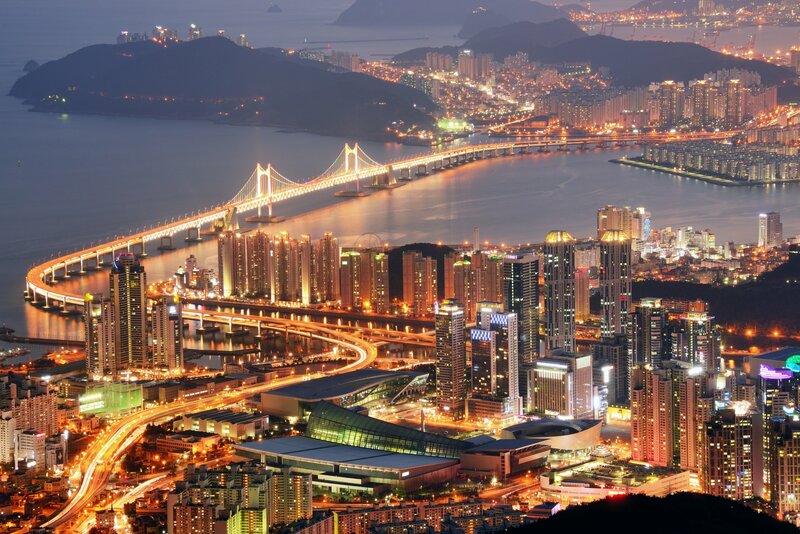 Our business class flights on Singapore Airlines were taken right in the middle of a massive trip around the world! If you want to know how Alex planned this huge trip (with a million moving parts), don’t worry — he’s written a whole post on it! If you want to know which credit cards he used to book all those award flights above, rest easy — he’s got a post on that too. 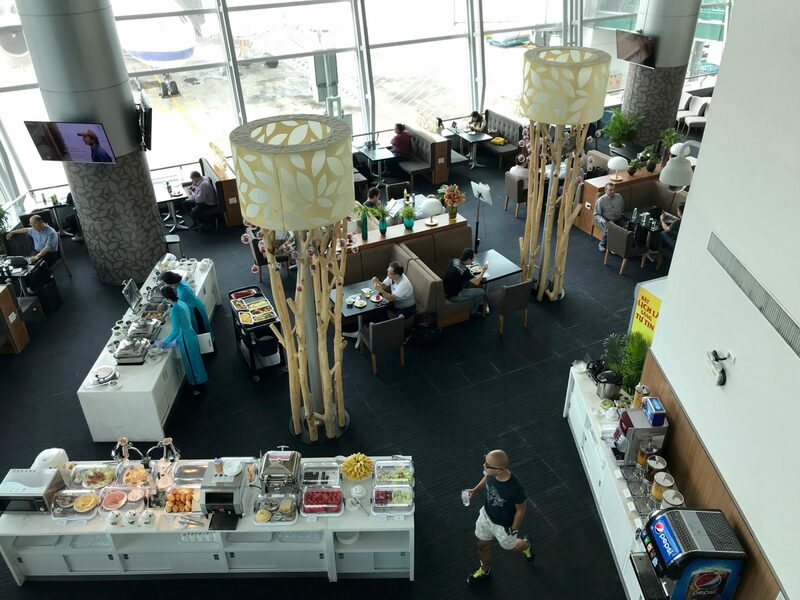 Finally, if you want to learn more about additional award flight options for getting to Singapore, there’s an article for that as well.